Learning their son, whose brain cancer continued to grow despite doctors' efforts to treat it, would likely not live to Dec. 25 prompted Todd Allen and his wife to move their family's Christmas up to September. Their mission to make sure 2-year-old Brody spends the rest of his life comfortable, happy and basking in love is one that includes stockings, festive yard decorations and -- now -- the assistance of strangers touched by their story. COLERAIN TOWNSHIP, Ohio -- Learning their son, whose brain cancer continued to grow despite doctors' efforts to treat it, would likely not live to Dec. 25 prompted Todd Allen and his wife to move their family's Christmas up to September . Their mission to make sure 2-year-old Brody spends the rest of his life comfortable, happy and basking in love is one that includes stockings, festive yard decorations and -- now -- the assistance of strangers touched by their story. "I read the article and I'm like, ‘This little boy lives literally five minutes from my house," neighbor Amanda Beckman said. "'We need to get involved and we need to do something.'" 'Something' became organizing a Christmas-themed parade in Brody's honor. The Sunday event will include floats, motorcycles and people dressed as superheroes, she said. Staging for the parade will take place behind the Sears at Northgate Mall. From there, it will travel along Springdale Road to the township administration building and park for a family-friendly party. "(We're) working on a balloon artist and face painting," Beckman said. "We've got bouncy houses; we've got some kids' games." Santa Claus will be there, too, according to Colerain police. To accommodate Brody's schedule and that of the township, the start time for the parade has been changed to 4 p.m. Brody will be the grand marshal. 4 p.m.: Parade leaves Northgate Mall (Springdale Road entrance). 5:15 p.m.: Parade ends at the Administrative complex. 8:30 p.m: Rozzi Fireworks display at the Administrative complex. No alcohol is permitted on the grounds and no onsite parking is available. A shuttle will run from Sears at Northgate Mall to and from the event. Visitors are asked not to park in the neighborhoods surrounding the Administrative complex. Springdale Road will be closed between Flattop Dr. and Yellowwood Dr.
from 3:45 p.m. to 5:30 p.m. and from 8:15 p.m. to 9:30 p.m.
Beckman said the support for her project and for Brody has been overwhelming. "I was telling my husband this has, like, actually restored my faith in humanity," Beckman said. 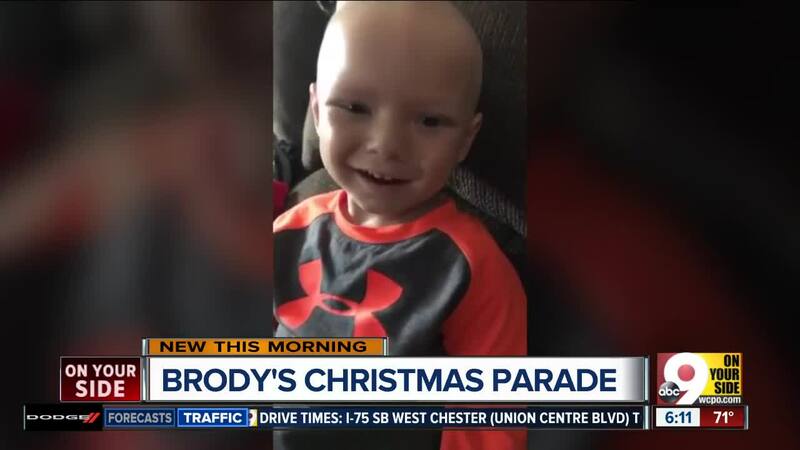 The parade will include more than 50 entries, and attendees are asked to bring Christmas cards and signs to wave along the parade route and to support Brody. The Allen family will privately celebrate Christmas Eve next Monday and Christmas Day the following Tuesday.